Just when you thought Pepsi week was over, comes the original scoop I had been talking about. 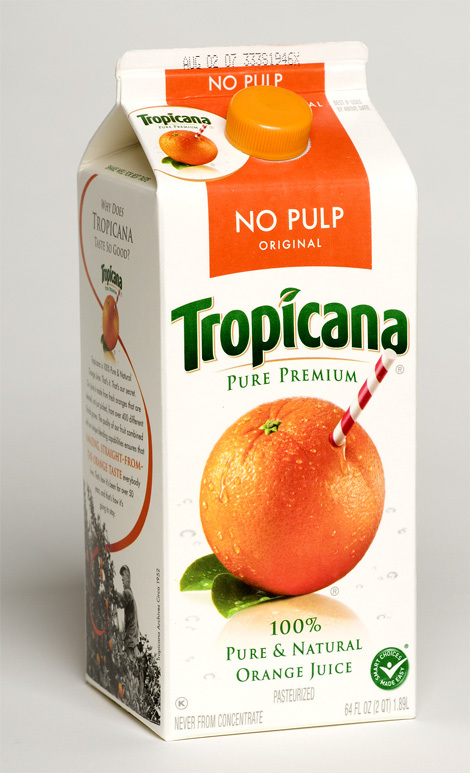 Tropicana, another one of the Pepsi brands, has also gone under the knife… or the juicer. This is perhaps the least offensive work we’ve seen come out yet but it certainly pales in comparison to the previous line of packaging designed by Sterling Brands that hit the shelves no more than one or two years ago at the most. This new packaging feels, at best, like a discount store brand with what looks like, again, at best, rights-managed stock photography if not outright royalty free. And the typography is, once more, at best, a lame derivative of how the British have lately exploited geometric sans serifs like Futura and Avenir to great results — here’s just one example of many. And I really want to believe that the screw-cap will not be an orange-colored boobie as in the rendering above. Previous packaging by Sterling Brands. \n\nJust when you thought Pepsi week was over, comes the original scoop I had been talking about. 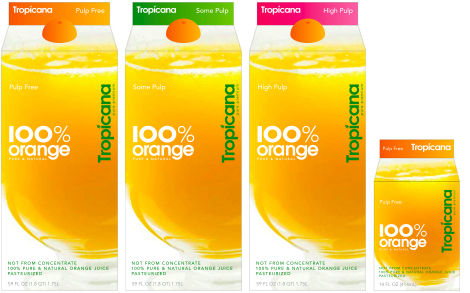 Tropicana, another one of the Pepsi brands, has also gone under the knife… or the juicer. This is perhaps the least offensive work we've seen come out yet but it certainly pales in comparison to the previous line of packaging designed by Sterling Brands that hit the shelves no more than one or two years ago at the most. This new packaging feels, at best, like a discount store brand with what looks like, again, at best, rights-managed stock photography if not outright royalty free. And the typography is, once more, at best, a lame derivative of how the British have lately exploited geometric sans serifs like Futura and Avenir to great results — here's just one example of many. And I really want to believe that the screw-cap will not be an orange-colored boobie as in the rendering above.